Search Engine Land and TechCrunch recently reported that Facebook has been rolling out a new feature that may help small businesses market their services locally. The Facebook Services site helps customers easily find service providers by location and zero in on the details of each nearby business. A potential customer can simply enter the type of service provider they are looking for (Landscaping, Home Repair, Fitness Centers, Accountants, etc) with their location and a list of local businesses is aggregated. In December 2015, Facebook was “in the early stages” of testing their services site. [i] As they continue to develop this new functionality, there is an opportunity for you to use this feature to help gain more local business. Make sure that your description makes it easy to understand the type of services you offer and for whom. Bad: We are a family-owned company that has been around since 1979. We love working with great people and would love to work with you. Good: We’ll help you transform your outdoor area. We specialize in residential landscaping for urban homes within the Greater Denver area. Keep your address and phone number up to date. There’s nothing more frustrating for a future customer than finding your business and then not knowing how to reach or find you. 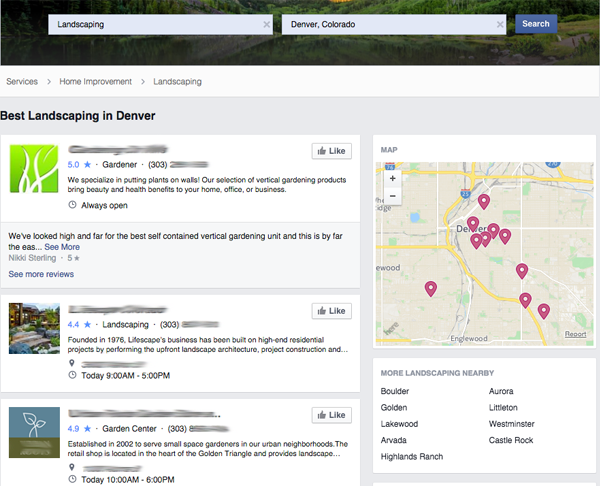 Here’s where you can really capitalize on Facebook’s new services search feature. If someone is looking for the kind of services you offer and they click on your business when you show up in the list, they will then land on your Facebook business page. In addition to having the domain to your business website available, make sure to use the call to action button. If someone has made it this far, they are likely to be ready to take action and schedule the services that they’re after. Make this process as easy as possible for them. You’ll need to decide which Call to Action makes the most sense for your business, and it’s always a good idea to test different methods to see how they perform for you. We really like the Book Now call to action option for many of our service-business customers who use appointment scheduling. This little button is a great tool since you can link it directly to your booking page, enabling your customer to easily schedule services or an initial estimate with you right then and there. This is particularly powerful if you are using an appointment booking solution that stores your customers’ information in a database where you’ll be able to track and manage your business relationship with them. This will allow you to follow up if you don’t hear from them for a while, or to send them special coupons or messages as appreciation for being a really great customer. If you decide to use the Book Now button, you might find this article helpful for promoting your scheduling/booking page: 5 Ways to Use the Book Now Button to Get More Appointments. If you’re ready for an advanced move—learn 4 ways to promote online appointments with deep links.